How many Volvoheads does it take to move a B20? 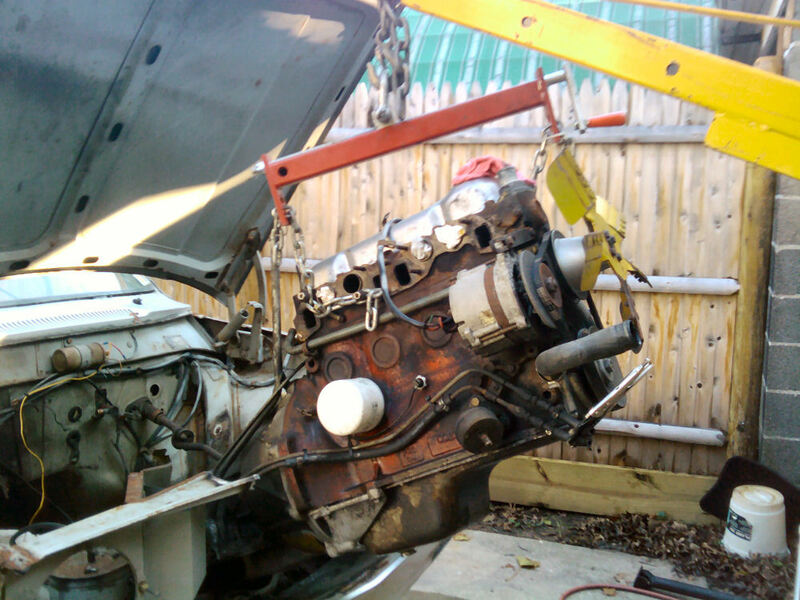 Granny’s B20 engine had been sitting, albeit well protected with oil and plastic, in my driveway all winter long. It was only briefly covered in snow once, but guilty feelings were growing day by day. Fellow RI Quahog Paul pinged the group last week promoting some kind of get together, so I replied: “How about coming to my house at 2 on Saturday. I could use a bunch of knuckleheads to help me move a motor.” An event was born. Careful plans were set: beer was procured, knuckleheads were contacted, and Paul had an appliance dolly. The engine coming out last Fall- made easier by butchering the radiator support with extreme prejudice. It turned into a beautiful 50 degree day. Many showed up, and Volvo enthusiasm was rekindled for springtime. The 444 and 1800 were started and the sweet smell of hydrocarbons and fuel stabilizer permeated the scene. After a while we noticed Paul and the dolly weren’t there. Mysterious. It turns out he had a calamitous injury that morning. Oh no! Poor Paul. Poor us, no dolly! Wait a minute…why don’t we just pick the thing up and carry it down? So the answer to the question is: Three. As long as you bolt an engine stand mount to the back. That makes things much easier.